We have two new adversary PDFs for you this week, one Rogues Gallery entry for Mutants & Masterminds, and a compilation of Mountain Terrors for the Chronicle System. 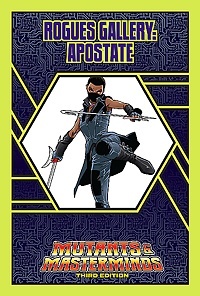 Pushed too far, once-caring Talia Wilson decided the only way to really change the world, to bring about a true revolution, was to become a villain and inspire people to rise up and destroy a corrupt system! As Apostate, she does everything she can to blunt the effectiveness of the government and point out its weaknesses. She swears that some day, she’ll have her revolution! There are more dangers in the highest mountains peaks than just avalanches, treacherous terrain, and foul weather. Here there dwell the terrors that make the highest reaches their homes, from the bestial alpingast to the nearly-unseen cloud leopard, from the legendary devouring shadow to the deadly skullcracker. Explore the dangers of the alpine reaches, in this compilation of the Mountain Terrors monsters! 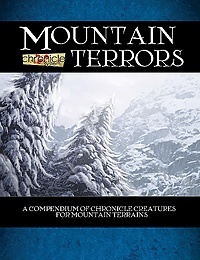 Mountain Terrors is a bestiary PDF for the Chronicle System, the rules engine that powers our popular A Song of Ice & Fire Roleplaying game. This product compiles all the high-altitude horrors from our Mountain Terrors PDF series, along with an all-new mountainous monster.